Sonnet's RackMac Pro makes Mac Pro rack integration simple. 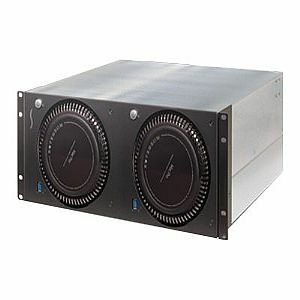 Configured with one mounting bracket to start, the RackMac Pro securely encloses one Mac Pro in 4U of rack space - with the optional second mounting bracket, you can mount two Mac Pros side-by-side. Because of the RackMac Pro's modular design, you can install or work with one computer at a time. Steel IconConstructed of sturdy steel to protect the computers, the RackMac Pro enables unrestricted airflow through the Mac Pros to keep them cool, according to Apple's specifications, even when the RackMac is installed between other equipment in the rack. A front panel power switch and USB 3.0 port for each computer enables you to turn the computers on and off, and connect a peripheral to each without having to access the back of the computer. Panel-mount HDMI, Gigabit Ethernet, USB 3.0, and power cables connect the ports on the back of each Mac Pro to ports on the back of the RackMac Pro for convenient external connection. The RackMac Pro's open-back design allows access to the computers' Thunderbolt ports.